Update 2013-03-29: The obscure project described in this and the following posts is currently a system of several websites stating that they have nothing to do which each other, but in truth is either one single person or a little group of collaborating persons. The following "identities" and Internet domains are currently involved: Hernan Gomez (hangdrum.us, hernandrum.com, handpandrum.us), Andres Gomez (sagittariushandpan.com), Fernando Alvarez (compraventahandpan.org). In addition a number of blogs and pages on advertising Internet platforms are used, offering a "Hang" or "Hang Drum". This trademark infringement is used to confuse people looking for a Hang by PANArt and offer them an extremely overpriced instrument of very low quality: The currently so called Sagittarius handpan. Update 2013-06-21: This project is going into a new round: After receiving much criticism the person(s) behind it obviously give up using sagittariushandpan.com as main site and are hiding currently behind a new name and website: STG on stg.webpin.com. It is the same project as before, using pictures and videos showed by sagittariushandpan before. Using also pictures of people playing the instrument who most likely never agreed to be used for advertising. Using the good reputation of the Integral Hang by PANArt as well to offer a low quality instrument for the ridiculous price of $ 3000 and more. There is a recent message on handpan.org about a Sagittarius handpan, that went out of tune very fast. There are better ways to burn your money. Update 2014-04-17: Some time ago the project changed its name again. Now the website is harmonicart.org and the instruments are called "Harmonic Sculptor" and "Harmonic Sound". It is the well known game: After receiving a lot of critics the old identity is shut down and a new one is started to still be able to profit from the uninformed newbies on the handpan market. As there are some discussions online in the recent past about handpanddrum.us (also called hangdrum.us which is mentioned in the statement by PANArt concerning eBay sales) and some people were unsure what to think about this, I think it can be of use to share some information and thoughts. 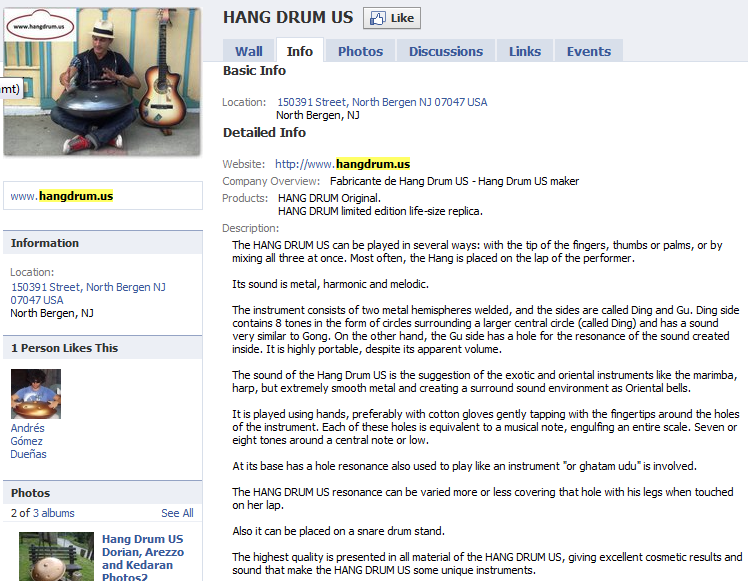 This "company" started in 2010 by making potential customers think they are offered "hang drums" built by PANArt. Later they sold so called "life-sized hangdrum us replicas" obviously targeted at people paying not enough attention to realize that those weren't instruments. And currently they offer instruments with bad quality for astronomical prices on eBay using a little number of videos. Over a long period in the beginning he has posted a lot of offers on auction and classified advertisement platforms making people think he is offering instruments built by PANArt (for example see this screenshot). Many of them are online by now. He also uses pictures of Hanghang, Halos and Bellart BElls to confuse his customers. He changed his eBay accounts very often. He never used his own real name in advertisements or on websites about his company. He never published a real address where his company is located. The names handpandrum.us and hangdrum.us make people think that the instrument is built in the US or that there is a company located in the US, but actually he is located in Colombia. He published a wrong US address making potential customers think that he is located in the US, but it was found out that there wasn't any company or person at that address. He used several free domain hosters to publish websites and changed the content very often. He used a faked person called "Liliana Gonzales" to communicate with customers. Lawyers tried to find out her identity but failed finding a real person. And Hernan Gomez refused to reveal her identity. So there are good reasons that she doesn't exist. He used photos showing musicians with his "instrument" that looks like if they are really playing it. But at that time no instrument existed, only the so called replica that cannot be played. He uses several names for his company at the same time. Currently for example he offers instruments on eBay and on handpandrum.us under the name "Hand Pan Drum US" while he also has a website under the domain hangdrum.us where he calls himself "Hangdrum Inc." (which incidentally is a trademark infringement). 2) On this screenshot you can see an extract of his former facebook page. It shows the faked US address. We also can see a musician obviously playing the instrument "giving excellent cosmetic results and sound" as the reader is told on this page. The real truth behind this bold statement leads us to the second reason not to trust handpandrum.us: This "company" has proven to offer bad craftsmanship. Some weeks ago a fellow Hang player told me the story of a friend who bought one of that "life-size replicas" (that was offered up to $500 on eBay) but was thinking that she bought a real musical instrument. She paid 250 Euro for it. When it arrived she found that it was damaged during shipping and therefor she brought it to Bill Brown, the maker of the Caisa to ask for a repair. He told her that this peace of metal was nothing that could be tuned in any way even if it was not damaged. He said that it was impossible vor any tuner to make an instrument out of this. Her friend (the Hang player) picked it up from Bill and showed it to me when we met some days later. Seeing and touching this "scrap metal from Colombia" (how she called it when she told me about this story) I immediately understood what Bill meant. Even for a decorative item it was of really bad quality, bad looking, roughly made and spot-welded only at a few points at the rim. Nobody should pay more than 5 Euro for it. And nobody with a minimum of good taste would hang that decorative item at the living room wall. After this experience there is reasonable doubt about the quality of the craftsmanship of handpanddrum.us as well as about Hernan Gomez's interest in providing his customers quality work. For example nobody can see how the two shells of the current instrument are attached. Will it be stable? Will the tuning be stable? Will there be rust problems? Nothing is known about these questions but there are proofs that Hernan Gomez delivered bad quality in the past and didn't care about whether customers thought that they are buying a real instrument while they bought a poor decorative item for crazy prices. Knowing his tendency to hide himself and being far away in Colombia it seems quite clear that it is needles to hope in getting service or getting one's money back when problems will occur after buying the instrument. 3) There are only a few videos made by handpandrum.us itself and nobody knows whether they are really representative for the delivered items. But even if we refer to the sound provided in these videos the price is way too high - together with all the rest we know about him a good reason to assume that Hernan Gomez is in this for making money and not for serving his customers. Crooks, out to make money and being in Colombia chances are you'll never see your money again if you do try to get a refund. Well informed post, thanks Michael. No name, no address, false location: United States. The domain is owned by someone called himself Andres Gomez Duenas. Son? Father? Uncle? Cousin? Or perhaps Hernan himself? On this screenshot we can see that the same Andres Gomez Duenas who owns the domain sagittariushandpan.com and states that he is running this company was in 2010 the first one who liked the facebook page HANG DRUM US. 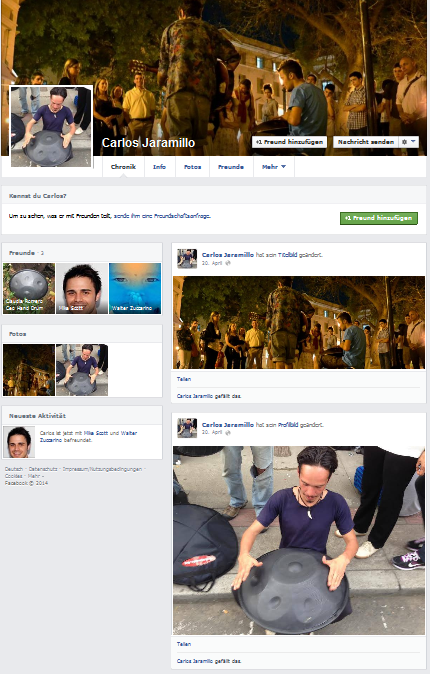 We can also see that at that time his profile picture showed him "playing" one of that hang drum us replicas a long time before he (if it is true) produced the new shells he said that he sold to Hernan Gomez. So there is a closer contact to the hangdrum.us business from the beginning than he stated in his post. He also supported that business since 2010. Looking at Facebook you can find, that Hernan Gomez from Medellin has a son called Andres Gomez. The vast majority of photos shown on sagittariushandpan.com was already used by handpandrum.us before (including the pictures with the woman). sagittariushandpan.com uses the same footer "Copyright © 2013 Sagittarius. All rights reserved. United States of America" as the current website hangdrum.us also including the false location United States. It is interesting that the footer hangdrum.us was changed after my initial post in this thread: "United States" was deleted. This can only be understood as an admission by Hernan Gomez, that he told his customers a wrong location of his company. Andres Gomez continues to spread this false information. sagittariushandpan.com uses the same free domain hoster mex.tl as Hernan Gomez used for his websites (sagittariushandpan.com is only a frame used for the pages on sagittariushandpan.mex.tl). Looking at the source code of the websites you can see that the identical technique is used to build the pages. Obviously the same website generator was used (compare with hernandrum.mex.tl). There is no about page on sagittariushandpan.com providing an address. This is a must for any serious business. Without this it is impossible to identify who Andres Gomez really is. And as long as he don't provide this information we should proceed from the assumption that he has something to hide. The Hernan Gomez story is continuing. And his main methods are still hiding behind other identities, concealing his true location Colombia, exploiting the wishes of people for the Hang and handpans by trademark infringements and telling lies. Let's see what currently is happening. All these identities are either the same person (most likely Hernan Gomez) or a little group of collaborating persons. If you visit one of the three domains of Hernan Gomez, you will be forwarded automatically to an advertising web page on the Spanish platform anunico.es. 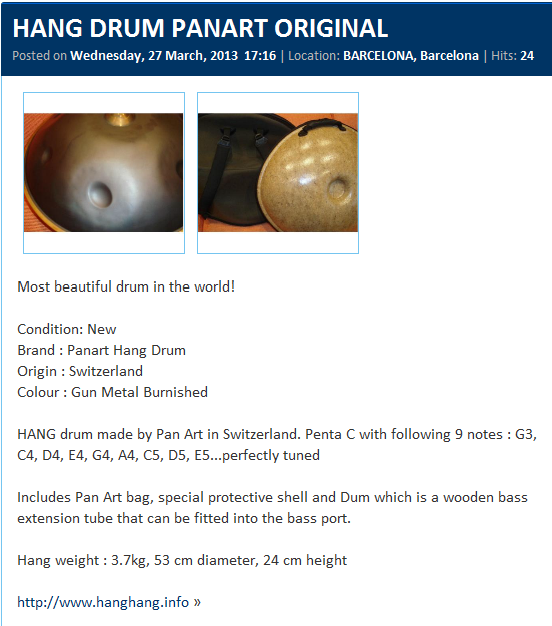 This advertising offers you a "HANG DRUM PANART ORIGINAL", "Condition: New", " Brand: Panart Hang Drum", "Origin: Switzerland". It is allegedly located in Barcelona. If you contact the vendor you will receive an email reply from a person calling himself "Adnelice Diaz Corredo", allegedly located in Miami Beach, saying, that the instrument is already sold. He laments, that he had problems with this instrument, because it was "unadjusted" and therefor he was forced to sell it for the half he originally wanted. But currently he has a very good Handpan that sounds even better than a Hang by PANArt: The Sagittarius handpan. It was much cheaper than the PANArt instrument and he bought it from the website compraventahandpan.org. A few minutes later you will receive another email by Fernando Alvarez. He tells you that Handpan brands Halo, Bells and Hang cost between 4,000 and 10,000 USD and offers you two options: Either to sell you a Halo, Bells or Hang with a waiting time of six months to one year, or to sell you a Sagittarius handpan within 15 days to one month for 2,100 USD. I think this is proving very well that the above mentioned unholy Trinity is one and the same obscure project located in Colombia. The offered instrument is of very low quality and with 2,100 USD extremely overpriced. And knowing all that obcure actions it is most likely that you will never get service in the case that you have any problem with an instrument bought from Sagittarius handpan far, far away in Colombia. 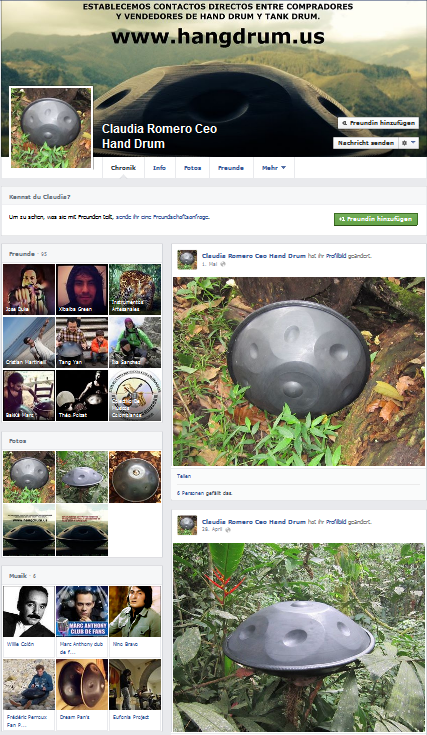 Trademark infringement by sagittariushandpan.com using the Name Hang for the Sagittarius handpan on a number of mercadolibre.cl adverstising pages. On the handpan.org forum a new user psanchez appeared and told the people that he played a Sagittarius handpan that sounds better than a Hang by PANArt. Most likely he is just another identity of the unholy Trinity. 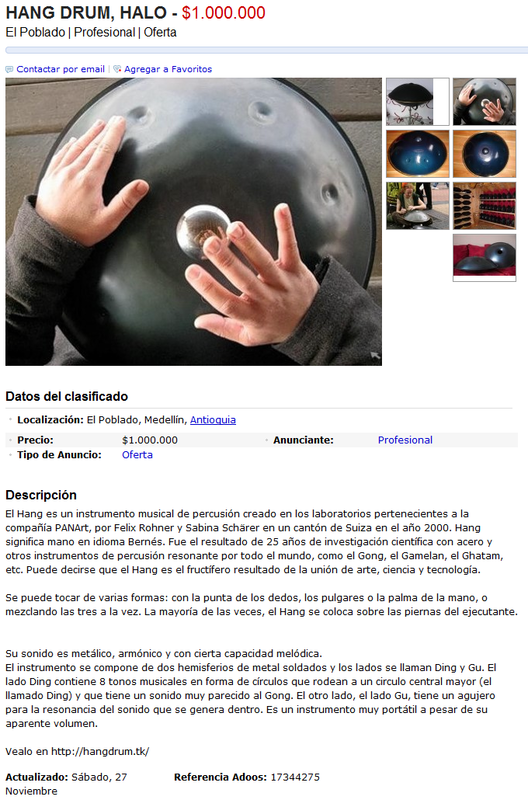 Looking at this picture published on the compraventahandpan.org website, it's quite clear that Fernando Alvarez is an avatar and not a real person. Soy Fernando Álvarez y estoy aqui para aclararles todas sus dudas ya que se habla mucho de mi empresa en estos foros. Fernando Alvarez and I'm here to clarify all doubts that it speaks much of my business on these forums. Last edited by fernandoalvarez on Tue Apr 09, 2013 3:56 pm, edited 1 time in total. Soy el propietario de la empresa COMPRA VENTA HAND PAN y quisiera en este foro defender con dignidad mis puntos de vista espero dar y recibir el respeto que ustedes se merecen, si tienes alguna pregunta que me la quieras hacer en privado mi correo es compraventahandpan@gmail.com, con el mayor de los gustos le responderé todas sus inquietudes. I own the company PAN HAND SALE BUY this forum and would defend with dignity my views and I hope to get the respect you deserve, if you have any questions you want to ask me privately my email is compraventahandpan @ gmail . com, the largest of tastes will answer all your questions. this Forum dont will support your liar business. I have delete your account. Please, dont come back! Thank you! Michael Paschko ...thanks you very much for this info, Very awesome job. I can see that this person has copied some of my photos of my web site, youtube videos and other things. I trust that many people can see this information...and no one is fooled. There were pics from HangOut on his site too, I sent him an email asking for them to be removed. They were taken down in less than 12 hours. After receiving much criticism the person(s) behind it obviously give up using sagittariushandpan.com as main site and are hiding currently behind a new name and website: STG on stg.webpin.com. It is the same project as before, using pictures and videos showed by sagittariushandpan before. Using also pictures of people playing the instrument who most likely never agreed to be used for advertising. Using the good reputation of the Integral Hang by PANArt as well to offer a low quality instrument for the ridiculous price of $ 3000 and more. There is a recent message on handpan.org about a Sagittarius handpan, that went out of tune very fast. There are better ways to burn your money. As I found out, the persons behind this project are still using faked "Original PANArt Hang" offers on classified advertising sites for fishing for new customers. If you send an email saying you are interested in that original Hang, you will get a reply saying, that the Hang is sold, but you are offered an STG instrument instead. There is also the first report on handpan.org that a buyer of an Sagittarius (= STG) handpan "tried to get a retune from the maker but never got a response back". There are two new faked persons currently used by Andres and Hernan Gomez from harmonicart.org aka hangdrum.us: Claudia Romero and Carlos Jaramillo.